Bassist Charles Mingus was one of jazz greatest innovators; this two-disc boxed set presents both his best-known and some of his most challenging material. 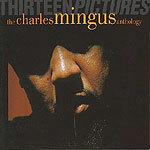 While a virtuosic bassist, Mingus' real contributions to the music came in composition and arranging. His genius is readily apparent in cuts like "Cumbia and Jazz Fusion," "Half-Mast Inhibition" and "Pithecanthropus Erectus," as well as in songs that have become standards of the jazz canon, like "Goodbye Pork Pie Hat," his tribute to Lester Young. As with all of Rhino's boxed jazz and blues sets, this collection is lovingly illustrated in the liner booklet.